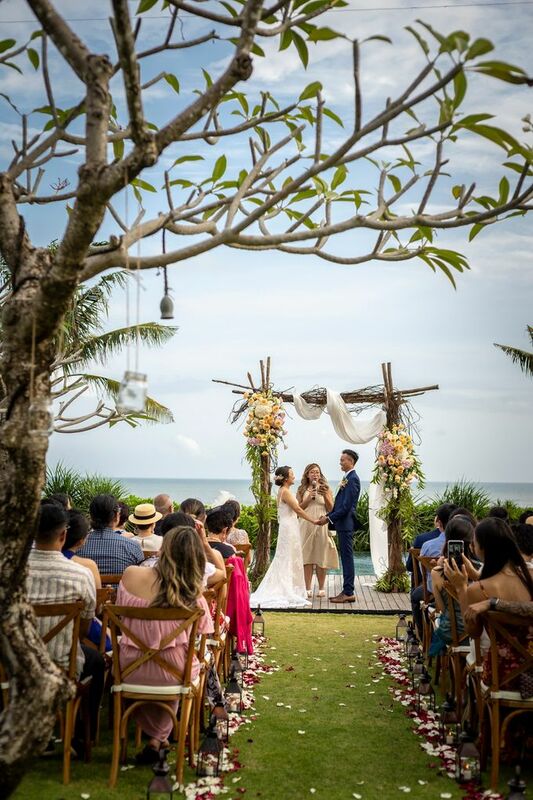 The wedding of Doug & Ellie took place at Arnalaya Beach House in Canggu. The brief was to embrace the natural landscape of Bali island; the greenery, the flowers, the natural beauty and simplicity of the island. The blue Indian ocean & Arnalaya's garden made a beautiful background for the ceremony and later - wedding reception. Rustic wood wedding arbor was the focal point for the ceremony. We incorporated greenery, flowers and draped off white chiffon fabric. To complete the look - we also added lanterns (with lit candles inside) plus white & red rose petals as the aisle marker. For wedding reception dinner - we designed a romantic tablescape - a round table embellished with white chiffon cloth, 6 floral arrangements in various glass vases, gold geometric lantern and some candles on top of small squared mirror . Last but not least - zig zag festoon light installation and dangling fair lights on the trees for effortless romantic mood.